Please make a small donation to help bring music to those with Alzheimer’s disease and advanced dementia! Or if you don’t want to use Kickstart to donate, we have a Paypal option! 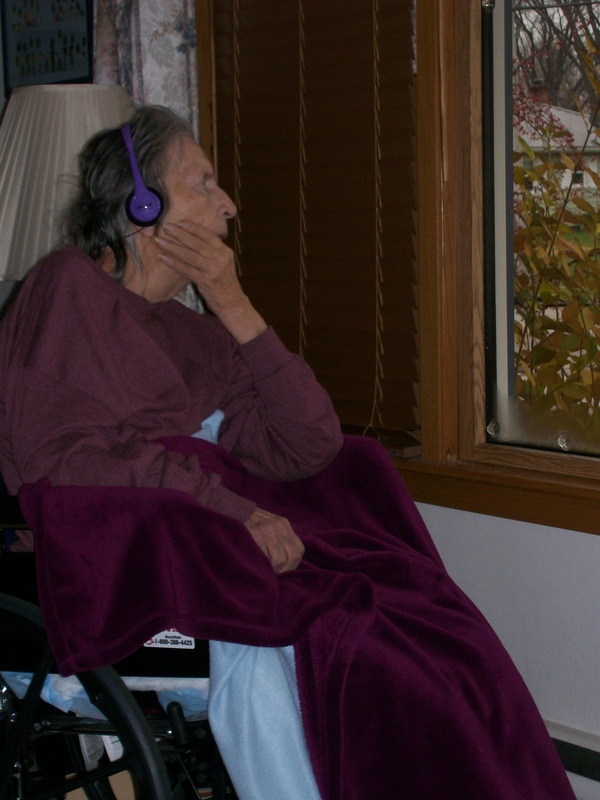 My mom has advanced dementia and music is about the only way she can still communicate. She loves to sing and I recorded her singing with me. So far we have over 40 songs recorded and they are available for FREE. All of our songs are well-known, well-liked favorites and they are in the public domain so you can download them to make personalized play lists for iPods or burn them to a CD. 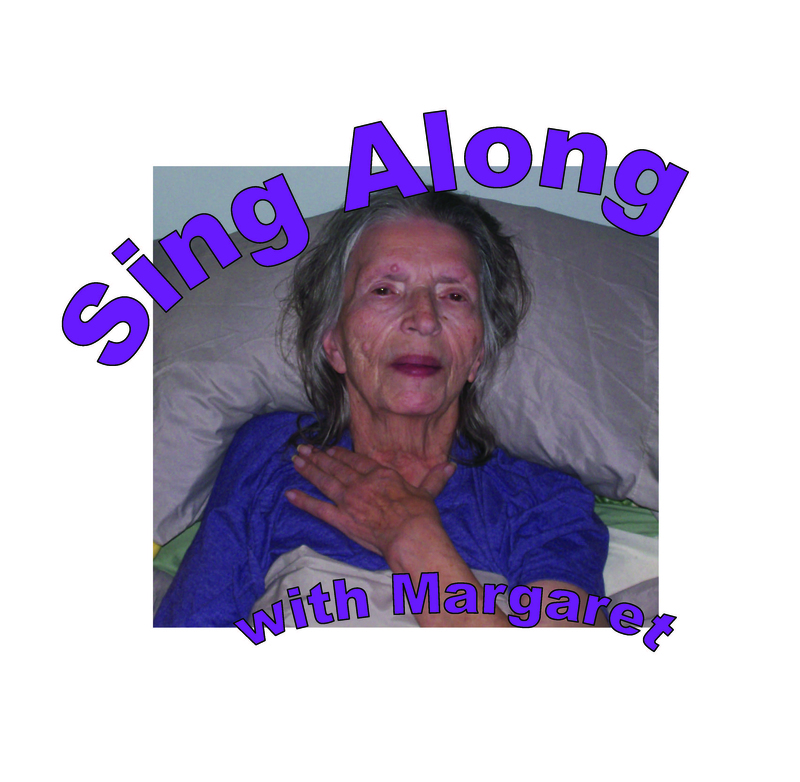 These songs bring joy to my mom and we want to share this joy with others. So please feel free to use our music! We’ll keep adding new songs! It is fairly easy to find hospice services when you need them. But you can be left high and dry if you ever leave the hospice program. In August 2013, after several hospitalizations and health issues related to lung cancer followed by blood clots in the lungs, combined with advanced dementia of the Alzheimer’s type, my mother’s physician suggested we look at hospice care. We had already agreed as a family that we would no longer seek treatment if the cancer came back in her lungs or anywhere else, and my mom’s age as well as the advanced dementia meant she was no longer a candidate for any surgeries. Hospice was offered as an alternative. I was the only one in my family who was reluctant about relinquishing Mom to hospice care. Part of it was that I wasn’t ready to admit that we were nearing that final stage in her end of life journey. But I also had the strong feeling that Mom just wasn’t ready to be a hospice patient. Nevertheless, I was out-voted by my siblings, and my oldest sister initiated the call to the local home hospice service and got the ball rolling. After a review of my mother’s case, she was admitted within a week of that phone call. On one hand, hospice was great. They provided an electric hospital bed which made it easier to get Mom up and also to re-position her for eating and sleeping. They also provided a wheelchair and a bedside commode. More importantly, they provided home care workers who came every day to help with bathing. Hospice also provided a nurse. Things were going well for almost 8 months. Or maybe they were going too well, because Mom stabilized: she wasn’t losing weight like she had been, she started eating more, she was more alert and even getting out of bed every day. About every 3 months they reviewed her case and I was reassured each time that she would still meet the program requirements. But in that last review, she didn’t and I was told that Mom would be taken off the hospice program. To me, this was the best news I had heard in a long time! But just as fast as she went on hospice, she went off, and she lost the home care workers, the nurse, the bed, commode, and wheelchair. And because her family physician doesn’t follow his patients into hospice, we were also left without a doctor. I had to scramble to make some calls. Fortunately, her doctor was willing to take her back, and I have to admit he has been very helpful and supportive. Mom and I are both thankful for that. I was also told that Medicare should cover a hospital bed and wheelchair, but I would need a prescription for each and it could take several weeks before we got the approval. But hospice wanted their equipment back right away. Luckily, I found a local medical supply company where I could purchase a bed, commode, and wheelchair to replace what hospice was taking back. But Medicare typically doesn’t reimburse for purchases you make before getting approval. I ended up paying about $3,000 out-of-pocket for the equipment I needed to continue taking care of Mom at home. I put it on a credit card and I’ve been making payments. It’s not the ideal way to do it, but it worked out for us. I was also able to locate a private-pay visiting home nurse. Medicare will not pay for this, so it is another out-of-pocket expense. But her prices are reasonable and I can afford to have her come to the house twice a month to check on Mom. The services you need are out there… if you can pay for them yourself! I realize not everyone can. Neither of my parents invested in long-term care insurance, and to be honest I never knew there even was such a thing until just recently. I did find other programs, like “community care” that helps seniors and disabled individuals stay living in their own homes. Because these programs save the state government the full cost of caring for people in nursing homes and other facilities, they are willing to provide funding to care for people in their own homes. It’s a great program, but you have to qualify for it. To qualify, you have to be below the poverty level. You can’t have any assets and you have to cash in your life insurance policies, annuities, pensions, and any other means of potential income. And there are rules for how you can decrease your assets and income so that you qualify for Medicaid. It seems that long-term care is an all-or-nothing deal. If you are below the poverty line, you qualify for services and everything is taken care of. And that’s a good thing. But if you have too many assets and too much income, you get absolutely no help, unless you can find ways to reduce your assets and income until you do qualify. But the odd thing is, there is almost nothing available for anyone who is not below the poverty level. I could probably get by if I only had a little help to keep my Mom at home. By a little help, I mean enough funding to pay for some home health workers to come in and help me a couple times a week and provide respite when I need it. But there are no such programs or services for those who are above the poverty line and only need a little help. But if you are willing to reduce your assets and income to get below the poverty line, then everything is taken care of and you get lots of help. It’s the same for hospice care. When you qualify, you get everything taken care of. As soon as you no longer meet the eligibility requirements, everything is taken away from you. There are no programs and services for those who are teetering on the edge, whether that’s teetering on the edge of poverty or teetering on the edge of a disease that is slowly taking your loved one from you. I have a feeling that my situation is similar to others out there. And that’s another reason why I want to continue this blog as a resource. If you have any comments, questions, or even advice to share about available programs and services, contact me. I’d be willing to share in greater detail what I’ve learned over the past couple of years as well. Even thought it has been just over seven years since we received “the diagnosis” that day is still fresh in my mind. A few weeks earlier, as I accompanied my mom to a clinic appointment with her family practice physician, we discussed my growing concern with Mom’s memory problems. There had been signs for a while, just small hints really, and at first you chalk it up to the reality that Mom is just getting older, and being forgetful is just something that happens. The most obvious thing was she repeated herself often. She remembered who called or who stopped in for a visit earlier that day, but she’d tell me five or six times, forgetting that she had already told me. She also kept asking me what day it was: “It’s still Monday, Mom. It was Monday five minutes ago when you asked me that same question.” It was easy to lose my patience in the beginning. She would also struggle to find the right word for something. She might ask, “Where is that ….” and then draw a blank and say, “I can’t think of what I want to say” and then finally give up and say “forget it.” It was frustrating for both of us. But these were just little things. We could live with this. Then she started doing things like making peanut butter cookies, but leaving out the peanut butter. Mom always was a great cook and loved to bake, too. Before she got married she owned and ran a diner. I watched her cook as a child and when I was old enough to help she taught me how to make her signature dishes. She rarely used recipes or cookbooks. She cooked from memory. But now that was slipping away from her. I noticed it before she did. But eventually she realized something was wrong, too. When her granddaughter requested a homemade cherry pie for her birthday, Mom was more than happy to oblige. I helped get all the ingredients she needed and I was her assistant in the kitchen. What started out as a happy, fun activity turned into a negative one. Mom was confused, couldn’t remember how to make the pie crust or how to roll it out. She was talking to herself, unsure of where to find things in the kitchen, constantly losing her train of thought. When the pie crust kept sticking to the counter and the rolling pin and ripping, she was getting more frustrated. In exasperation she muttered, “I don’t know why I have to do this!” I tried to help, but then she got mad at me. But we stayed with it and eventually got the pie in the oven. It looked a little funny and it wasn’t like the pies Mom used to make. When my sister saw it she was a little disappointed. But I knew Mom had done her best. Things were changing and we needed to start accepting that. One of the bigger problems with Mom’s memory related to finances. She would forget to pay bills, she did not remember how to balance her checkbook, and she started to get overdrawn once or twice a month. I was still working and getting paid twice a month, and I deposited one of my paychecks into her account a month and she was still running out of money. Because she forgot several credit card payments, the company called and set her up with an automatic monthly payment that they took right from her checking account. They were taking about 50% of her monthly social security income. When I called to have that stopped, they wouldn’t discuss her account with me because I didn’t have power of attorney over her finances. So I checked on how to do that, filed the paperwork, and began managing my Mom’s finances for her. I’ve heard many people refer to the five stages of loss and grief after hearing the diagnosis of “dementia of the Alzheimer’s type” and I can understand why they make this reference. That first step is denial, and I think I certainly was in denial when the signs of memory loss first began to show, and I know Mom was in denial for a longer time, even after she was diagnosed. After the first round of testing, however, it was pretty hard to deny what was happening any longer. Even though I have reached the stage of accepting “the diagnosis” and accepting that Mom is not going to get better and that her memory and her functioning will continue to decline, I still find myself weaving in and out of the stages of anger, depression, and bargaining. Grieving is not linear. It loops back on itself over and over. Understanding that is part of acceptance. But I have learned not to grieve for what has been lost. Mom cannot cook, bake, or drive anymore. She cannot walk. Most days she cannot even talk. But she is still a complete person and she is still there. There is still much more to celebrate than to grieve over. On the door of Mom’s bedroom I hung the poem “An Alzheimer’s Request” (also known by the first line of the poem “Do not ask me to remember”). At the bottom it says it was written by an unknown author. So to whoever wrote it I must apologize for changing one of the lines. The Last four lines of the poem read, “Just remember that I need you, / That the best of me is gone, / Please don’t fail to stand beside me, / Love me ’til my life is done.” I changed it so it reads “the best of me is not gone” because I believe that even though this disease has taken many things from her, the best of my Mom is still there. She has not been lost. 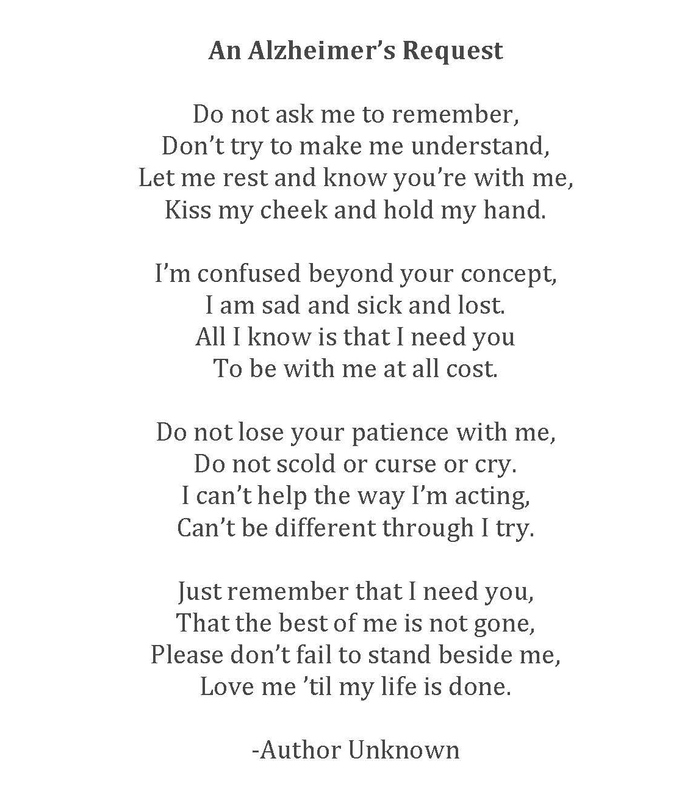 The above poem was changed (in the second line of the last stanza the word “not” was added) to reflect my belief that even though dementia and Alzheimer’s disease takes a lot away from a person, the best of that person is never lost. 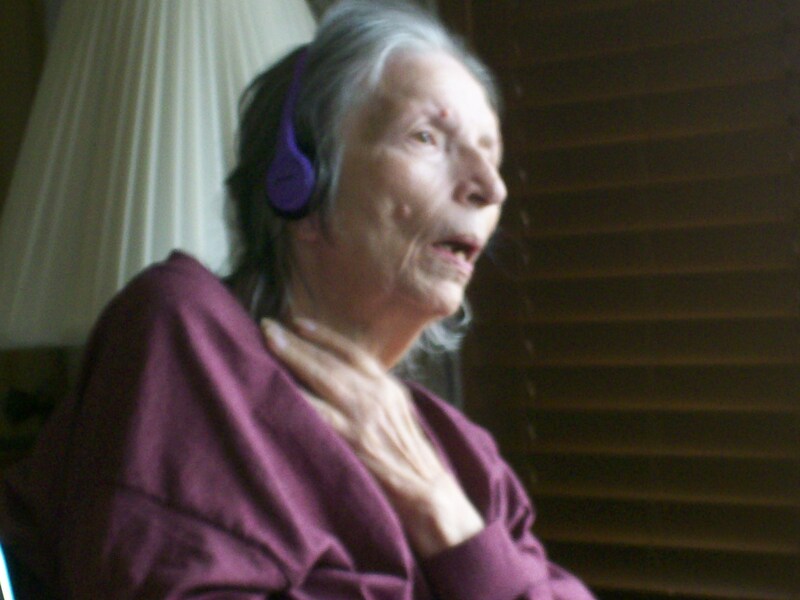 Music is very powerful, and research shows it is therapeutic for people with dementia. The Wisconsin Dementia Care System Redesign: A Plan for a Dementia-Capable Wisconsin (published earlier this year by the Wisconsin Department of Health Services) recommends the Music & Memory program, which teaches caregivers and health professionals how to create play lists of “favorite songs” that are then delivered using an iPod with headphones. The program is evidence based, and I have every reason to believe that it works because I have done something similar on my own with my mother. Because she lives at home with me, we do not need to worry about disturbing anyone with our music, so headphones are not necessary; besides, Mom doesn’t care for the headphones and she is always pulling on them or on the cord, so we just use a small CD boombox to play our music. While it is important to find music that is meaningful, there are several songs that are universal and well-liked and known by just about everyone, such as “You Are My Sunshine,” “My Bonnie Lies Over the Ocean,” and “I’ve Been Working on the Railroad.” For my mom, there is one song that always snaps her out of a bad mood (whether it is sundowning, anxiety, or hallucinations) and that’s the old German folk tune “Du, Du Liegst Mir Im Herzen.” Some of her other favorites are “Bicycle Built for Two,” “The Band Played On,” “I’m Looking Over A Four-Leaf Clover,” and “Wooden Heart.” Repetition is not a problem. 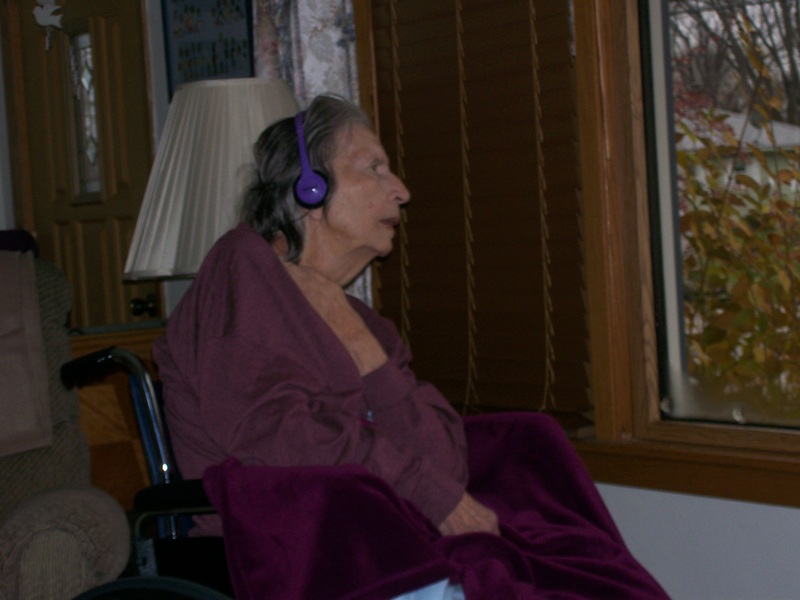 She can listen to these few songs over and over, and for people with dementia, the repetition can help: it might take a few choruses of “You Are My Sunshine” before they start singing along. I happen to be musically inclined: I play piano and guitar and I like to sing, so music has always been a part of my mom’s therapy at home. She responds much better to “live” music than recorded music. If I play my guitar in her room, she is much more engaged. If I play a CD of a familiar singer (like Elvis) it is mostly just background noise and she doesn’t respond as well. It’s when I (or someone else in her room) sing to her and with her when music has the best response. The only thing was I was playing my guitar or keyboard so often that my fingers hurt. So I decided to record the songs, just using the built-in mic on my laptop and then burning the songs to a CD that plays in her boombox. It has the effect of “live” music, but I can be doing other things while we sing (such as washing her hair or doing the dishes). Even if you cannot play an instrument, you can still sing together, and you can still record it so you can play it back as much and as often as needed. I uploaded an example of our “music therapy” to YouTube. So here we are singing “Zip-a-Dee-Doo-Dah” — http://youtu.be/plwDkhRATCk (it is also linked on my Google+ page if you’re interested in checking it out). I have so much to share with you. I have been the full time caregiver for my mom since June of 2010; over the past few years I have discovered great resources, and I have quite a few tips and suggestions that I know will be helpful to other caregivers. I am just starting to write it all out. So I wanted to start with this disclaimer: my posts will be out of order, and until I catch up, this blog will not necessarily be a chronological story of my experience as a caregiver. The dates on the posts will reflect when I finally put the information in writing and published it; the dates will not always reflect when events described in the post occurred. I will do my best to tag each post and to sort them into categories to make this blog easier to navigate. The categories are listed on the right side right under the “search” box. This will make it easier to find the information that is most relevant to those who will be reading and looking for specific tips or resources regarding caregiving, Alzheimer’s disease, dementia, and end of life. As always, I welcome feedback, comments and any suggestions on how to improve this blog. Or if you have a tip, resource, or experience to share, please contact me. Yes, it has been eight months since I set up this blog and I have yet to start blogging. First, it’s been a busy year, but I know that is no excuse. Second, and this excuse is legitimate, I have been working through some legalities to protect my intellectual property and my future plans to evolve this blog into an important resource for caregivers. I am in the process of registering “The End of Life Survival Guide” as a trademark linked to my business, Advantage Consulting Services, LLC. I am registering this trademark under two classes: Providing a website featuring information about health and wellness, namely, Alzheimer’s disease, dementia, caregiving, and end of life; and Educational and entertainment services, namely, providing motivational speaking services in the field of Alzheimer’s disease, dementia, caregiving, and end of life. Part of the process is establishing use of the trademark, and I will do this through this blog. My other dilemma is over ethics. I am the financial power of attorney, the medical power of attorney, and “declared representative” for my mother, as well as her primary, full-time caregiver. How much information should I share about her? Am I invading her privacy? Am I violating HIPAA? Is this blog and what I choose to share about my experiences as caregiver an assault of her dignity? Is it disrespectful? I’ve had many conversations with my mother over my various roles, and she has always stated that she trusted me to do what is in her best interest. My mom is also a very caring and helpful person, and she raised me to share her same values. I truly believe that my mom approves of what I am hoping to accomplish here: to share our experience of her journey to the end of life, to provide information, resources and tips, all with the hope of helping others who are going through a similar experience of their own. So now that I have made progress on resolving the legal and ethical barriers that have delayed my start, I am ready to proceed. My name is Doug Seubert, and I am a full time caregiver for my mother who has advanced Alzheimer’s disease. I decided to create this blog so that I can share my experience and provide tips, resources, and ideas to others who are caring for a loved one near the end of life. The title of this blog is not meant to be ironic, sarcastic, or even funny. But it does represent what I hope to do here: help caregivers and their families — as well as those they love and care for — to survive during the most difficult time in a person’s life. If you have any questions about anything you find on this website, please contact me. And if you have questions about caregiving, or if you have advice or ideas to share with others, please feel free to post comments.